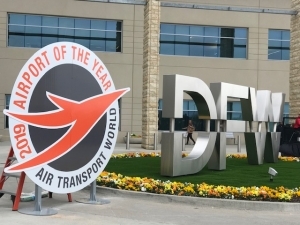 DFW AIRPORT (WBAP/KLIF) – Dallas Fort Worth International Airport has been recognized as the 2019 Airport of the Year by Air Transport World, the leading media brand serving the global airline and commercial air transport industry for more than 50 years. In 2019, DFW anticipates serving an average of nearly 200,000 customers per day with new domestic and international destinations and nearly 1900 flights per day. In 2018, the Airport announced 28 new destinations, offering more domestic destinations than any other U.S. airport announced nine new international flights, doubling its European destinations and frequencies since 2015. It also completed a $2 billion renovation and renewal of three legacy terminals. ATW will formally recognize DFW Airport and all award winners at a ceremony on March 26.